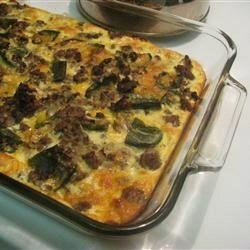 "This is a Mexican-style casserole made with hamburger and green chile peppers. It produces a much simpler version of chile rellenos, which are simply stuffed chile peppers." See a simple, shortcut version of cheesy chile rellenos. Great if you add lots of cumin, chili powder, oregano and garlic powder. Pretty good dish! Seems more like a spicy breakfast meal than one eaten at lunch but we still liked it. Also, add the taco seasoning to the meat...it really does the trick! Next time i would use more cheese and a little less beef. I also added taco seasoning. Very good.